The French surgeon Jean Civiale was one of the most significant figures in the history of urology, the branch of medicine dedicated to the urinary (and male reproductive) systems. 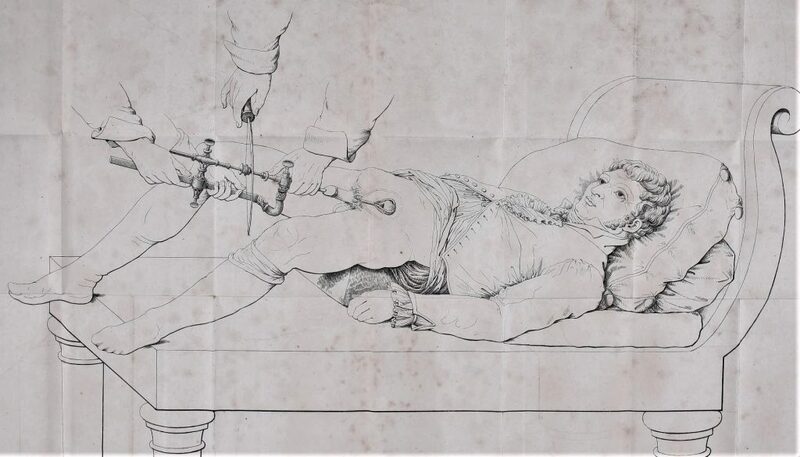 In the 1820s he devised the technique of lithotripsy to treat bladder stones, the first minimally invasive surgical procedure. Until then, the only way to remove such stones had been to make an incision and extract them with forceps – an excruciatingly painful operation which often resulted in death. Lithotripsy was safer and less uncomfortable for the patient: an instrument was inserted into the bladder via the urethra and used to crush the stone. The resulting fragments would then be evacuated with the urine. The patient was a man whose constitution had been exhausted by excesses and pain, and who had a large stone in his bladder. I even doubted that lithotripsy was feasible. Civiale suspected that this stone (also known as a calculus) was too large to be treated using his special crushing instrument (known as a lithotrite) – but was soon proved wrong. The calculus turned out to be friable and was broken up at the first attempt, and the treatment then proceeded with regularity. In the end, while looking for the last fragments of the stone, I felt a hard body which was resistant to pressure and whose nature I could not at first determine. The strange object was covered in a layer of material from the recently pulverised bladder stone, which made it difficult to identify by touch alone. I became certain that the body was flat, of small volume, and that it possessed no projections capable of wounding the inner surface of the urethra. So I decided to extract it, which proved neither difficult nor painful. When he had removed the mystery object, Civiale had a surprise. It proved to be a locket nearly 3 cm long and 1.5 cm wide. Only then did the patient tell us that, having indulged in wine, he fell asleep on the banks of a river a short distance from a wash-house, and that the washerwomen introduced into his bladder the locket which one of them was wearing!